Home Flower Care	Flower Spotlight: Tulips! 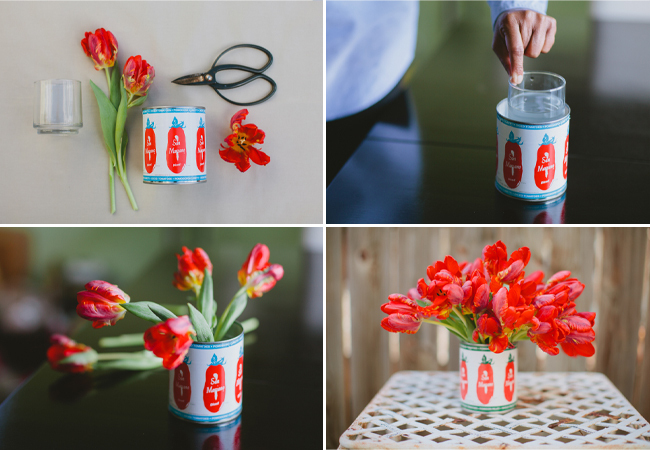 Plus, 2 Easy, DIY Tulip Centerpieces! Tulips are beautiful flowers with a sleek and clean appearance which makes them versatile and very popular in the wedding world. 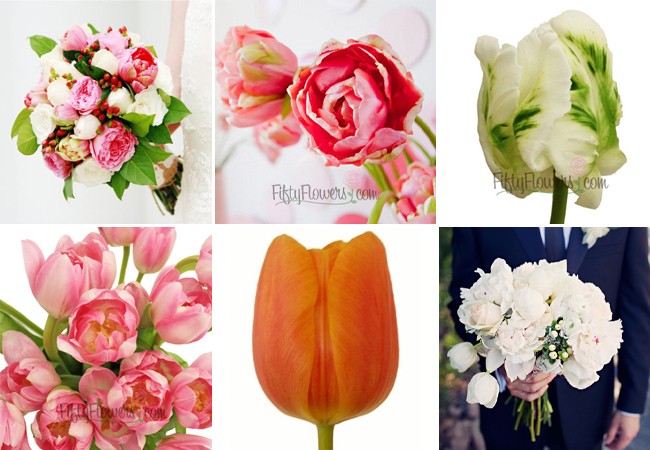 At FiftyFlowers, we carry several different varieties of Tulips, including Standard, French, Parrot, and Peony Tulips. To learn more about each variety of Tulip, Click Here. Tulips are unique in the fact that their petals and their sepals (the outer protective petals) are almost identical. In contrast, think of a rose, when in bud form the rose is covered in green sepals. When the rose blooms, the sepals peel back to reveal the rose petals, and the sepals remain at the base of the rose (usually four to five green leaf-like sepals). In the Tulip, because the petals and the sepals are almost identical, they are called tepals, and they make up the bloom of the Tulip. Tulips will open into a cup or star shape bloom to reveal 6 stamen and sometimes a darker or slightly different colored base. Another thing that makes Tulips unique, is that when cut, they will continue to grow! There are also phototrophic, meaning they will follow light, but we will discuss that later, when I go over Tulip care! 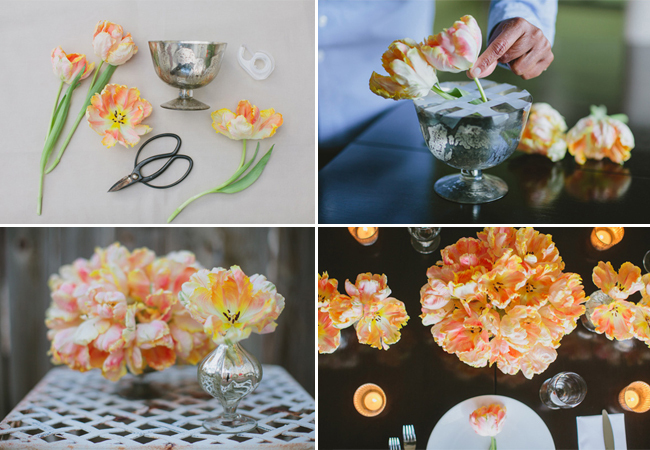 Now, lets check out 2 different DIY Tulip Centerpieces. Both projects were done by Janie Medley, of The Bride’s Cafe, and star gorgeous Parrot Tulips from FiftyFlowers. But you could use any tulip variety or color! Both projects were photographed by the talented Tori of Marvelous Things Photography. Check out both Centerpieces, then click on the images to see the DIY Instructions! Check out the DIY Instructions here. Click here to see the DIY Instructions. Both centerpieces are super easy…the first allows for more of a free-form design, while the second uses a tape grid to give the centerpiece a bit more structure. Both would be great for Spring, Easter, or anytime of year! The ideal date to have your Tulips delivered is 1 to 2 days prior to your event. Cut bottom of stems diagonally approximately at least and inch from bottom under running water with sharp scissors or knife. This will create a fresh surface to absorb water. Immediately after cutting, place the stems in the prepared water. Please note that your Tulips will continue to grow for about a day after they have been put in water. Allow flowers at least 4 hours to hydrate well. However, it is best to wait at least 8 hours before arranging. Place Tulips in a place with even light, or rotate frequently as Tulips will turn to face the light. Change water every 24 hours to keep flowers fresh. This will keep the water from becoming contaminated with bacteria that blocks the flower’s availability to absorb water. Assure that your flowers have sufficient water. The flowers will drink an exceptionally large amount of water upon arrival. Tulips have a natural bend to them, and although I like this natural look, if you want your flowers to stand straighter, follow these tips…Trim stem tips and roll the Tulips in newspaper with the paper extending above the flower tops, but not covering the lower third of the stems. Place them upright in water with a source of light directly above them. Tulip heads naturally follow the light, so placing a light directly above them will help to straighten a bent stem. I hope you enjoyed this Tulip spotlight! Now, head to FiftyFlowers, to check out our whole selection of Tulips, and find the perfect one for you! Real Wedding: Classic Neutrals and Fresh Florals!